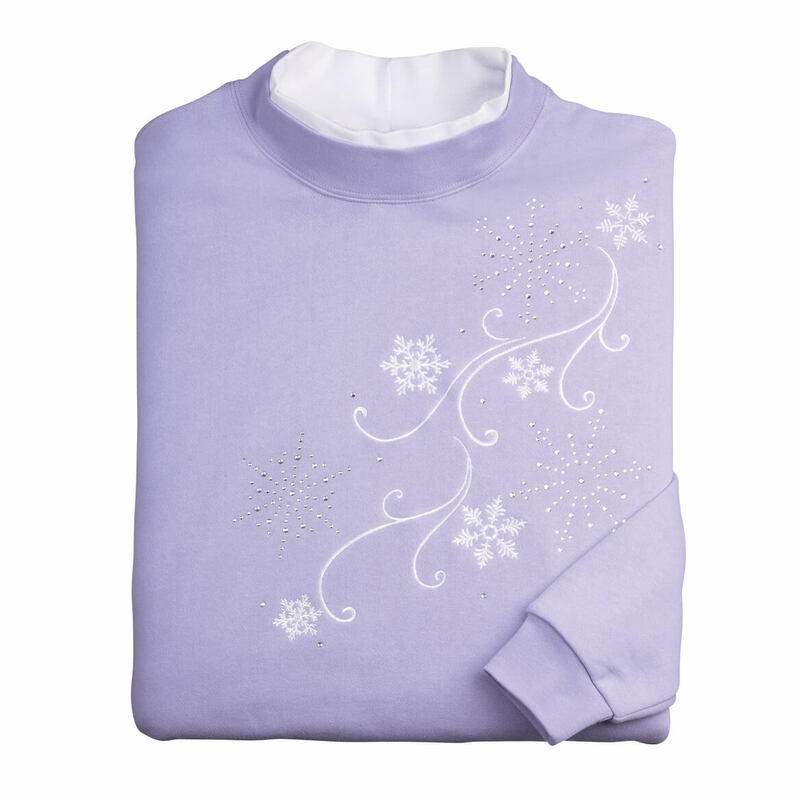 Graced with elegant embroidery and embellished with bling snowflakes, this Embroidered Cascading Snowflakes Sweatshirt proves you don’t have to sacrifice style for cozy comfort. 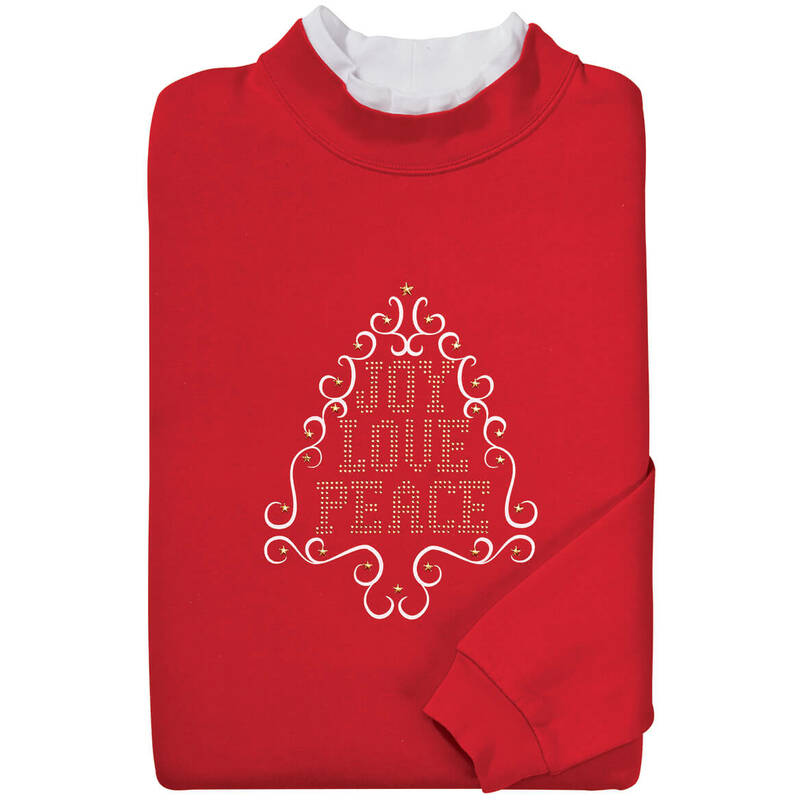 Decked with “Joy, Love, Peace” and gold star-shaped rhinestones, this Festive Tree with rhinestones sweatshirt sparkles with festive style to love every year! Exclusively designed by Sawyer Creek Studio™, the boutique-style women’s sweater inspires compliments galore. Intricately rendered on soft, premium fleece in 60% cotton/40% polyester—it offers warm, festive comfort for many holidays to come. The classic holiday sweater features white mock collar with banded sleeves and hem. Specify size: medium, large, XL or XXL. Machine wash cold. Imported. Religious sweatshirts celebrate the Easter message in a beautiful way. 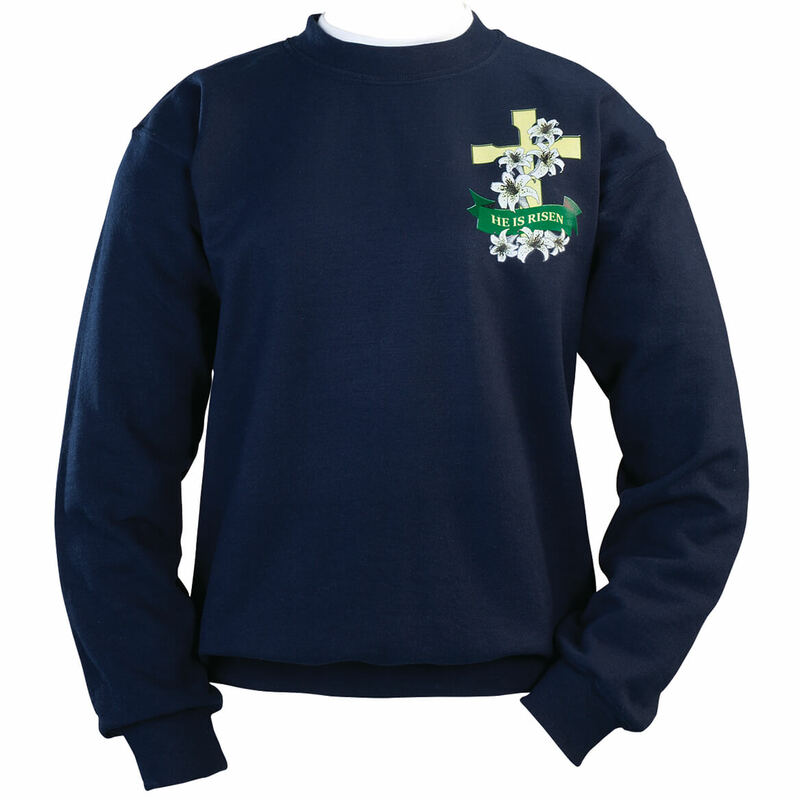 Our Christian sweatshirt features a cross, blooming lilies and the joyful affirmation, “He is Risen”. A classic style to wear all year, in deep navy with white mock collar, banded bottom. Specify size: small, medium, large, X-large. 50% cotton/50% polyester; machine wash. Imported. 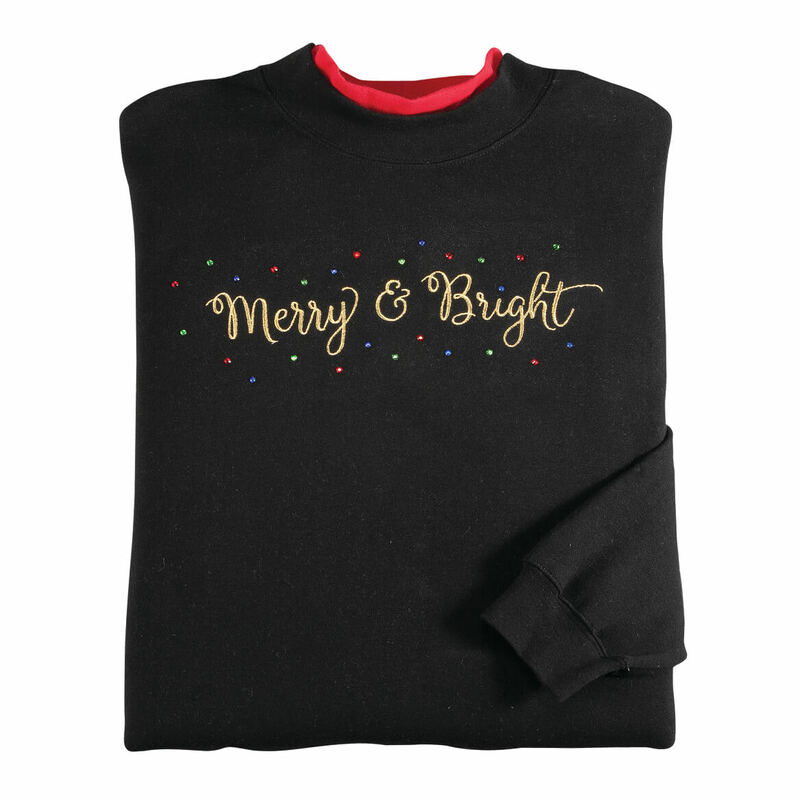 Our Merry & Bright sweatshirt’s embroidered message is charmed with colorful bling that looks like Christmas lights! Featuring intricate stitching and acrylic beads, the comfy black holiday sweatshirt is designed exclusively by Sawyer Creek Studio in a premium blend of 60% cotton/40% polyester for a soft touch and lasting wear. Featuring a red mock collar for a pop of color and layered look, the easy-wearing women’s sweater includes rib knit cuffs and banded bottom. Specify size: medium, large, XL or XXL. Machine wash cold. Imported. 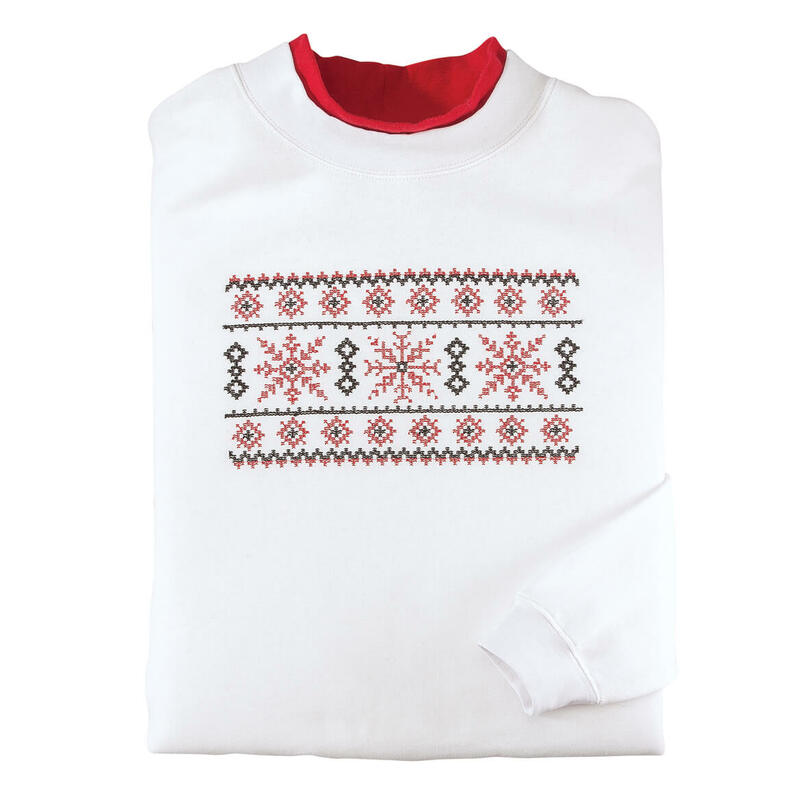 Graced with an embroidered Nordic sampler pattern, our Nordic Icons sweatshirt has the timeless charm of a nostalgic favorite. Designed exclusively for us by Sawyer Creek Studio in a premium blend of 60% cotton/40% polyester, the classic white fleece sweater offers cozy comfort, a soft touch and lasting wear. Featuring a red mock collar for a pop of color, the classic women’s sweater includes rib knit cuffs and banded bottom. Specify size: medium, large, XL or XXL. Machine wash cold. Imported. 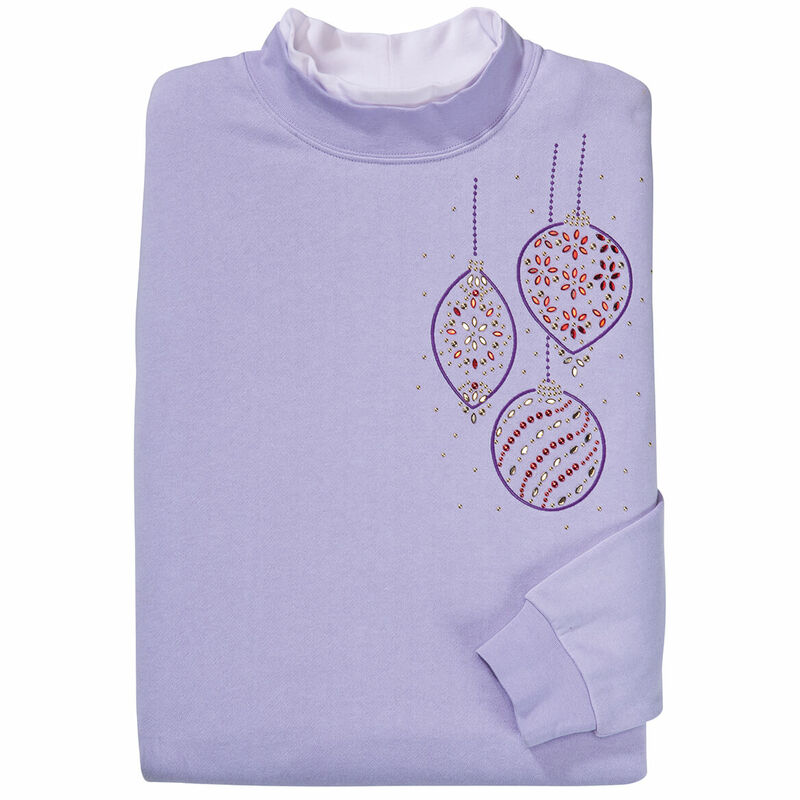 Graced with gold beads, sparkling gold and red rhinestones and intricate purple embroidery, a trio of ornaments turns our comfy Sparkling Ornaments sweatshirt into your head-turning holiday favorite! Offering unique boutique style at great Kimball price, our exclusive women’s sweatshirt is meticulously designed by Sawyer Creek Studio™. The soft, premium fleece is an upgrade from ordinary versions in 60% cotton/40% polyester—assuring ultimate comfort and lasting wear. The classic holiday sweater style features white mock collar with banded sleeves and hem. Specify size: medium, large, XL or XXL. Machine wash cold. Imported. 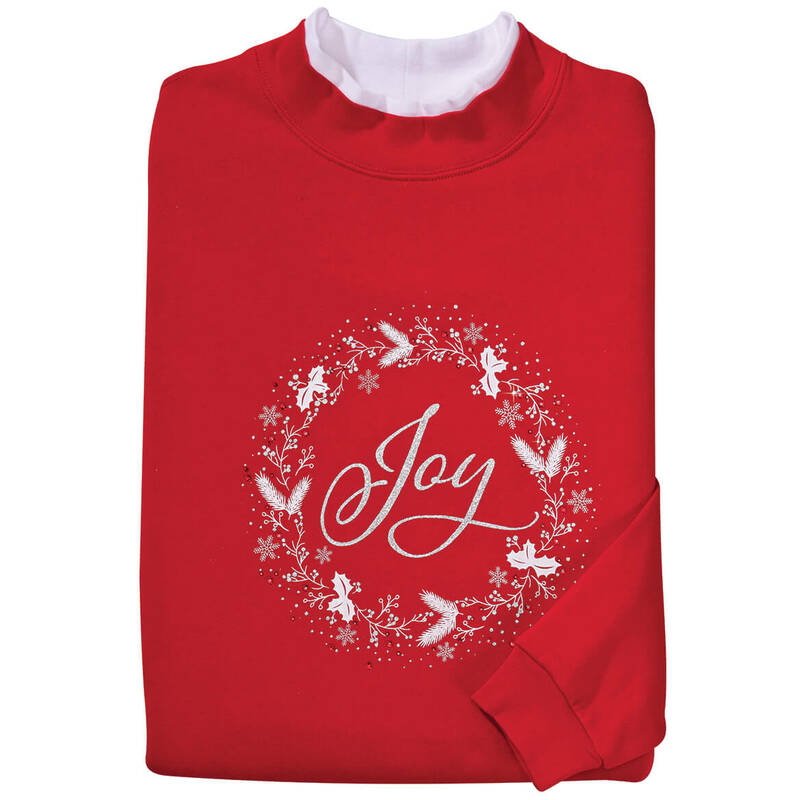 Sparkling with red rhinestones and shimmering glitter, this festive Shimmering Joy sweatshirt is the perfect mix of comfort and JOY! The tiny red rhinestones glisten like holly berries, adding a merry touch to the artful design. Exclusively styled by Sawyer Creek Studio™, our gorgeous red holiday sweater boasts soft, premium fleece in 60% cotton/40% polyester—a joy to your world for many holidays to come. The comfy women’s sweater features white mock collar with banded sleeves and hem. Specify size: medium, large, XL or XXL. Machine wash cold. Imported. 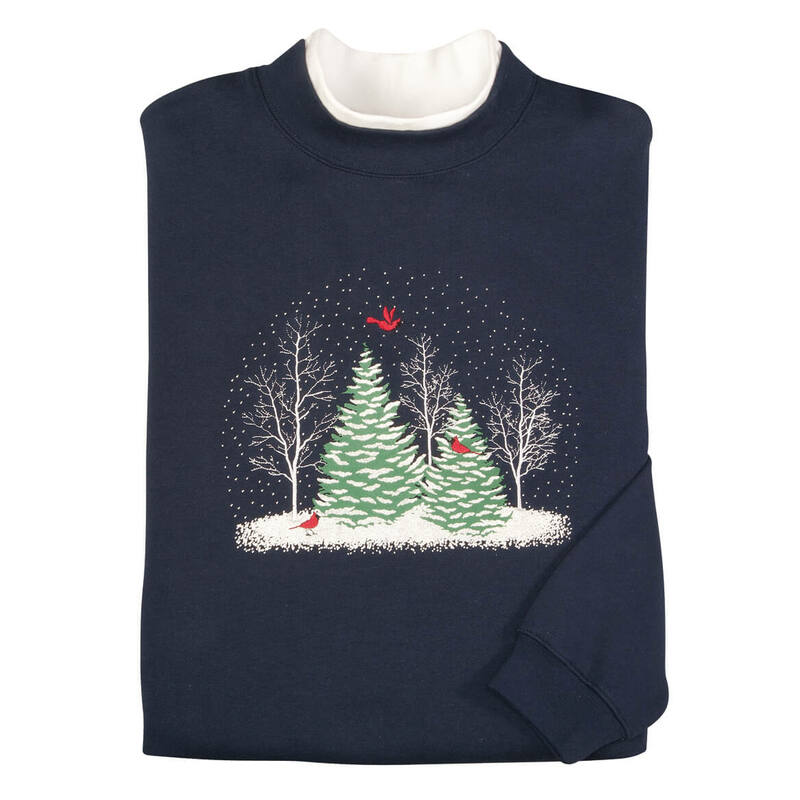 With frosted trees, bright cardinals and a flurry of wintry magic, our Snowglobe Trees sweatshirt is truly unique. Designed exclusively for us by Sawyer Creek Studio in a soft, premium blend of 60% cotton/40% polyester, the rich navy fleece sweater promises live-in comfort and lasting wear—year after year. Featuring a white mock collar for a layered look without bulk, the classic style includes rib knit cuffs and banded bottom. Specify size: medium, large, XL or XXL. Machine wash cold. Imported. 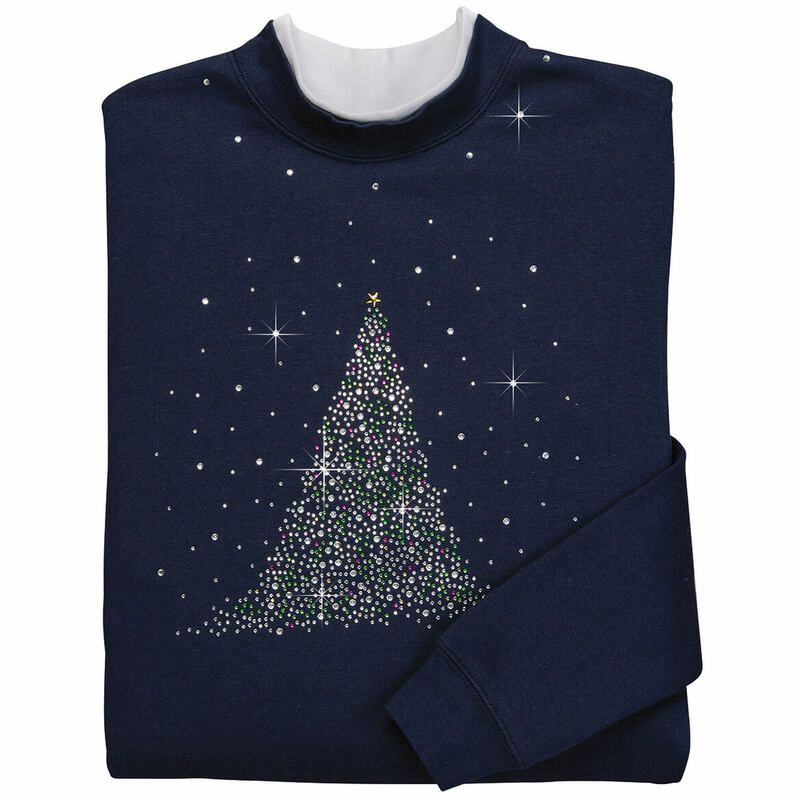 Hundreds of bright, shiny beads form this sparkling tree sweatshirt, giving our women’s sweater unique, sophisticated holiday style. Designed by Sawyer Creek Studio™ and only found here, it’s simply irresistible in navy blue with white mock neck and banded bottom. 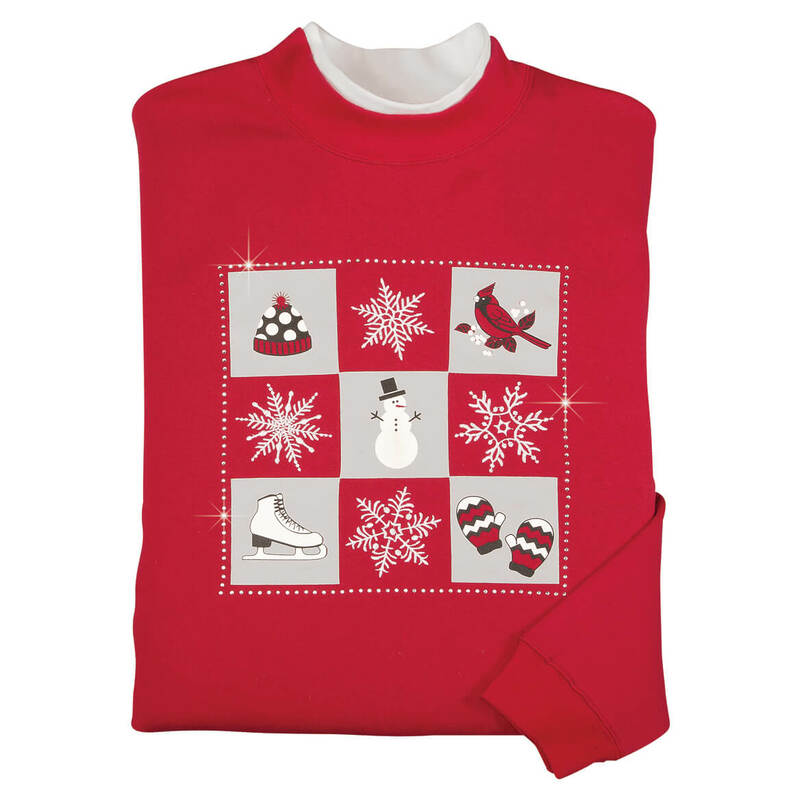 Holiday sweater made with 60% cotton/40% polyester; machine wash cold. Imported. Graced with cheerful symbols of the season, our Winter Icons sweatshirt features intricate embroidery, artful charm … and a border of tiny rhinestones for a touch of winter sparkle. Designed exclusively for us by Sawyer Creek Studio, the vibrant red fleece sweater is a premium blend of 60% cotton/40% polyester for soft comfort and lasting wear. Featuring a white mock collar for a layered look without bulk, the classic style includes rib knit cuffs and banded bottom. Specify size: medium, large, XL or XXL. Machine wash cold. Imported.